The Hope diamond, the largest deep blue diamond in the world, property of the Smithsonian Institution. It is thought to be a recut of the Great French Blue diamond of 122 ct, obtained in trade and brought to Europe by Jean-Baptiste Tavernier. It disappeared in the French Revolution. Carbon is amazing. Where would life be without it? It forms short molecules, including the one essential to (previously) intelligent life, ethanol. It forms long linear molecules (aliphatics), round molecules (aromatics) and even spherical molecules (fullerenes) or cylinders (nanotubes). As a solid it forms thin, strong sheets (graphite). If such a sheet is composed of a single molecule, one layer thick, it becomes the wonder material graphene, useful for just about anything from protecting mobile phone screens to distilling whiskey. Graphite is black, but graphene is transparent. And finally, it can form crystals. These are the diamonds, beautifully transparent and the hardest material known on Earth. Diamonds set pulses racing. No matter how useful they might be for their hardness, the beauty wins out. Rarity has something to do with this. There are not many places where they are found, and the market is tightly regulated by the de Beers company, Cecil Rhodes’ final legacy. Wars have been fought over them. Diamonds even have their own measure of weight: one carat is 0.2 grams. Its origin is the carob seed which is remarkably uniform in size and weight. Before the great African finds, the only major source for diamonds, and in particular large diamonds, was India and the kingdom of Golconda. As long ago as the middle of the 17th Century, 20,000 men and women were employed at the main mines and in all more than 50,000 people were employed in their extraction, according to the French traveller and explorer Jean-Baptiste Tavernier, Baron d’Aubonne, who made six long voyages to the East between 1630 and 1668. Almost all of the famous, historical diamonds hail from this locality and were described first by Tavernier: the Koh-I-Nur (Mountain of Light), thought to have been discovered 5,000 years ago, the rose-pink Nur-al-Ain (Light of the Eye), the inscribed Shah, the large, flawless pink tablet Darya-I-Nur (Sea of Light), the Taj-I-Mah (Crown of the Moon). The mere names fascinate and spellbind our imagination. Originally, diamonds were found in alluvial deposits along major rivers. The discovery of their real origin was made in South Africa. The Colesberg used to be a flat-topped hill, on the farm of the de Beers brothers. Diamonds were found near it, far from any river, and in 1871 digging started at what is now called the Kimberley mine. At one time, 50,000 people were involved with the manual digging. By 1914, further digging finally became too dangerous and unproductive. The ‘hill’ was now 240 meter deep and had become (and still is) the deepest hand-dug hole in the world. All in all, 2700 kg of diamonds were retrieved. For some time South Africa accounted for 90% of the world’s diamond finds. Further finds were made elsewhere in southern Africa, including the coastal desert sands of Namibia, in Botswana, Angola, and the Congo. The largest mine is the Yubileyny diamond mine in Siberia, or Argyle in Western Australia, depending on how reserves are counted. South Africa now only accounts for 15% of diamond discoveries. Diamond mines still look like the Kimberley: a deep hole extending vertically into the ground, with a small footprint for its depth. How do these diamonds form and how do they end up in these narrow pipes? Surprisingly, and in spite of their extreme hardness, diamonds are not fully stable. If heated to 900C, a diamond will convert to graphite, and it is not possible to form diamond at normal temperature and pressure. Diamonds form only under specific conditions: high pressure (45-60 kilobar) and moderately high temperatures (900-1300 C). These pressures are reached in the lithosphere at 150-300 kilometer depth, but temperatures here are often a bit high, especially underneath oceanic plates. Temperatures in the lithosphere underneath thick continental plates are a bit lower, and diamonds can form and survive here. It has recently been argued that sea water, taken down into the mantle by subduction, can allow diamonds to form at less extreme depth. 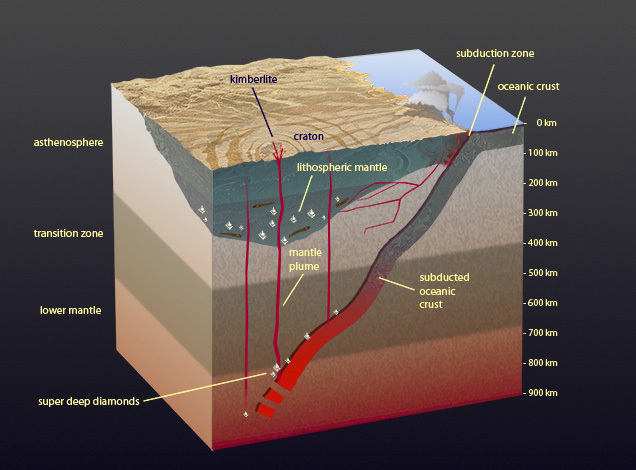 Diamonds can form in the mantle below the lithosphere, as long as enough carbon is available. A few diamonds come from the crust, but the large majority formed in the mantle. The mantle is a complex region. The lower mantle sits above the Earth’s core, between 600 and 2900 kilometer deep. Above this, between 400 and 600 kilometer deep, is a transition zone, and above the transition zone is the upper mantle. Part of the upper mantle can attach itself to a continent, forming a mantle keel. Diamonds form mainly in the upper mantle and transition zone, and from there find their way to the mantle keel. Diamond come in two different types. Eclogitic diamonds are associated with basaltic magmas, and formed in or from subducted oceanic plates. Peridotitic diamonds are found in peridotites, rocks with more than 40% olivine, and are associated with the mantle. Olivine is a magnesium-iron-silicate (ultra-mafic), ranging from fayalite (almost no magnesium) to forsterite (almost no iron). The two types of diamonds can be found together and can form underneath the same region, perhaps at different times and different depths. For eclogitic diamonds, the carbon from which the diamonds are made must have comes from the ocean, brought into the mantle by subduction. The carbon of peridotitic diamonds may come from the mantle itself, but this is an open question as the original mantle material is rather carbon poor. The two types differ in the fraction of C-13 (the rare, heavy isotope of carbon) compared to C-12 (the normal, light isotope), suggesting there is some difference in the source of their carbon. The Mir diamond mine in Russia contains eclogitic diamonds with two different isotopic ratios, showing that the source of the carbon could change over time even in one location. One diamond even has both compositions, one in the core and another in the rim: the change of carbon source happened while this diamond grew. The growth of the diamond must have been on a geological time scale, as slow as the dance of the continents. Super deep diamonds are a rare group of diamonds which contain inclusions of minerals which only form under extreme pressure, in the lower mantle. They are known mainly from Juina State, Brazil. The inclusions formed at around 650 kilometer depth, at the transition between the upper and lower mantle. A very deep subducted slab reaching down to the lower mantle may have provided the rare conditions to form diamonds at this extreme depth. Plumes then brought the diamonds to the bottom of the continental craton. There is one other way to make diamonds: major meteoric impacts. The pressures from a big impact (we are talking dinosaur extinction size here) is high enough to flash carbon into diamonds. They are tiny, and not useful for fashion purposes. Microdiamonds also exist in space, and it is possible that some of these diamonds came with the impact: alien diamonds, too small to see, but perhaps older than the Earth. All diamonds are ancient. The volcanoes which brought them up from the deep are typically 100 million years old, but the diamonds found in them have ages from 1 to over 3 billion years. 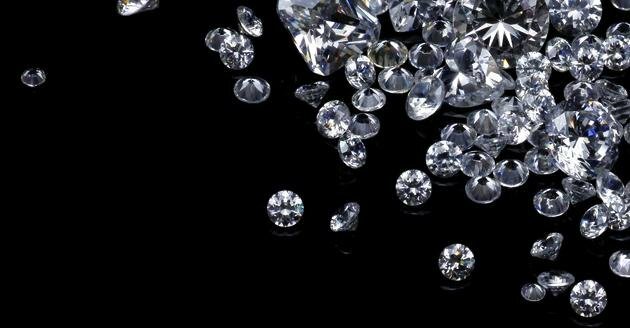 In Canada, diamonds have been found as old as 3.5 billion years. Eclogitic diamonds are younger than 3 billion years; peridotitic diamonds are often older. The oldest diamonds formed when the Earth was a very young, and very different, planet! Volcanoes with kimberlite magmas are found both on ancient cratons and in younger locations. But only those volcanoes on the cratons contain diamonds; the kimberley magmas in younger locations are diamond free. The cratons are the ancient cores of the continents, such as in South Africa, Sierra Leone, India, Brazil, Canada and Siberia. Only they are old enough to have protected the diamonds stored underneath in their mantle keels. The ancients still have it. Perhaps diamonds only formed in the distant past and do so no longer, or they took forever to form. Protection against mantle heat was necessary: otherwise the diamond would ‘graphitise’. 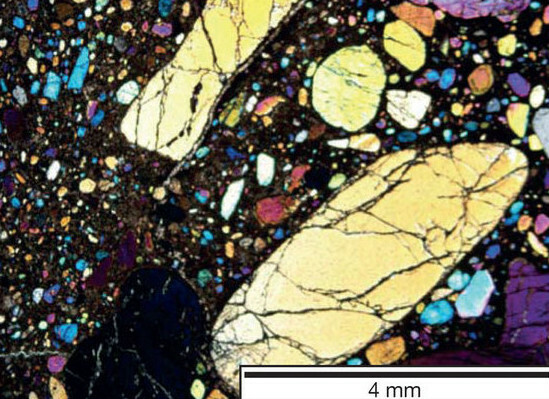 The remnants of graphitised diamonds have been found in pyroxenite bands in Morocco, which come from hot peridotite. Not all diamonds have survived! The South Africa craton formed from a western part and an eastern part, brought together in one of the oldest continental collisions known. The diamonds found in the western part of the craton are 3.2 billion years old, and the eastern ones are 1-1.5 billion years. Presumably the ancient subduction zone, where diamonds formed, extended underneath the western part. The eastern diamonds formed during a rather more more recent subduction event. As with any rule, there are exceptions. The Argyle diamond mine in Australia is located off-craton. The age difference between eclogitic and peridotitic diamonds deserves attention. Eglotitic diamonds form from carbon in the sediment at the bottom of the ocean, which is subducted into the upper mantle. Much of the carbon is deposited as carbonates by living organisms. Life favours the lighter isotope C-12 over C-13, and indeed eclogitic diamonds tend to have lower C-13. Their carbon comes from life. The peridotic diamonds lack this signature of life. Life is believed to have started 3.8 billion years ago (give or take a few hundred million years), but there is little fossil evidence older than 2.5 billion years and it is possible life had a slow start. When did life really colonize the deep oceans and when did life start to rule the Earth? The eglotitic diamonds are less than 3 billion years old: the isotopic ratios show that life was abundant by that time. The peridotitic ones are mostly more than 3.2 billion years old. Perhaps this was at a time when carbon was still deposited on the ocean floor through normal chemistry, not involving life? If the peridotic diamonds also get their carbon from subduction, perhaps they come from a time when life wasn’t as important. Diamonds are old enough that the Earth where they formed was different from the planet we know. But not completely different. The eclogitic diamonds tell us that subduction existed 3 billion years ago, and therefore plate tectonics is at least that old. Getting to the diamonds to the surface requires volcanism of a different dimension. Basaltic volcanism, which brings mantle material to the surface, tends to occur in spreading centres where the mantle is warm – far too warm for diamonds. Continental volcanism operates from magma chambers typically 10-20 kilometer deep, not 200! Neither is likely to bring up diamonds. Indeed, the volcanoes of the diamond excavations are unlike any other. The diamonds are found with a solidified magma called (of course) kimberlite. It is a rare, highly basic rock with a lot of greenish olivine, various minerals such as mica, serpentine, and calcite, but lacking quartz or feldspar. The olivine comes straight from the mantle, from a coolish melt which formed at 200 kilometer depth which is somewhat deeper than the location of the diamonds. The diamonds are hitchhikers, picked up on the way. How the magma gets the buoyancy to break through 200 kilometer of rock, while carrying a load of perhaps 25% of various minerals and diamonds, is hotly (no pun intended) discussed. Volatiles are needed, but these are lacking in the mantle. Lionel Wilson, and more recent Donald Dingwell, have argued that the driving force is CO2. The ultra-basic mantle magma is rich in carbonates, which dissolve as CO2 into the magma. While traveling up through the rocky base of the continent, the magma picks up silicates which melt into the magma and make it more silicic. This acidifies the magma, and makes the CO2 much less soluble. Eventually the CO2 becomes saturated, and comes out of the solution to form a foamy gas, which breaks the crusts and creates an open path for the ascending magma. It behaves like a shaken bottle of fizzy drink. The kimberlite travels extremely fast: 20 meter per second in the dyke, reaching explosive speeds of up to 400 meter per second near the surface, close to Mach 1. The ascent from the base of the continent to the surface can happen within days or hours. The diamonds carried up by the extreme buoyancy do not always survive: kimberlite contains a mix of unbroken and broken diamonds, and diamonds can be destroyed and form CO2 if the magma is oxidizing. The faster the diamonds are carried up, the more likely they are to survive. The high speed rips up pieces from the surrounding rock, and incorporates them in the magma. Kimberlite is quite a mismatch. The amounts of magma making this long journey up are not large. Kimberlite volcanoes are small or very small, and eruptions do not last long, perhaps only days. 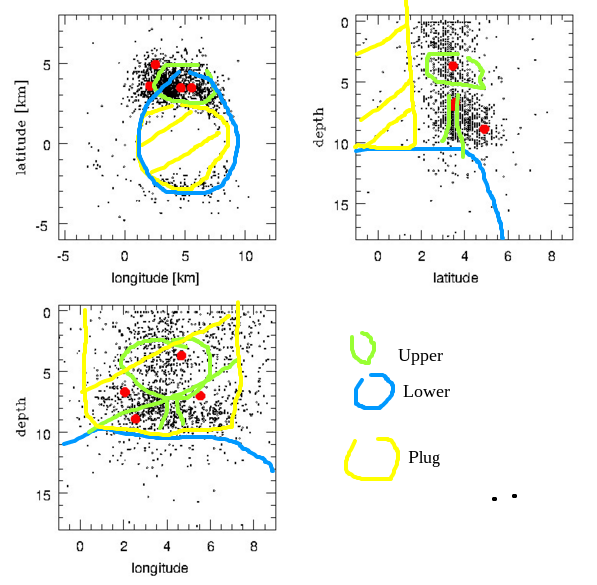 The craters are typically only 500 meters across: a small hole at the end of a feeder pipe extending 2-3 kilometer down, where it connects with the dyke coming up from the mantle. Kimberlite sills may form but are rare. The lava that erupts is quite cool, perhaps as low as 600 C. Diamonds are found in the pipes and sills, but rarely in the dykes. 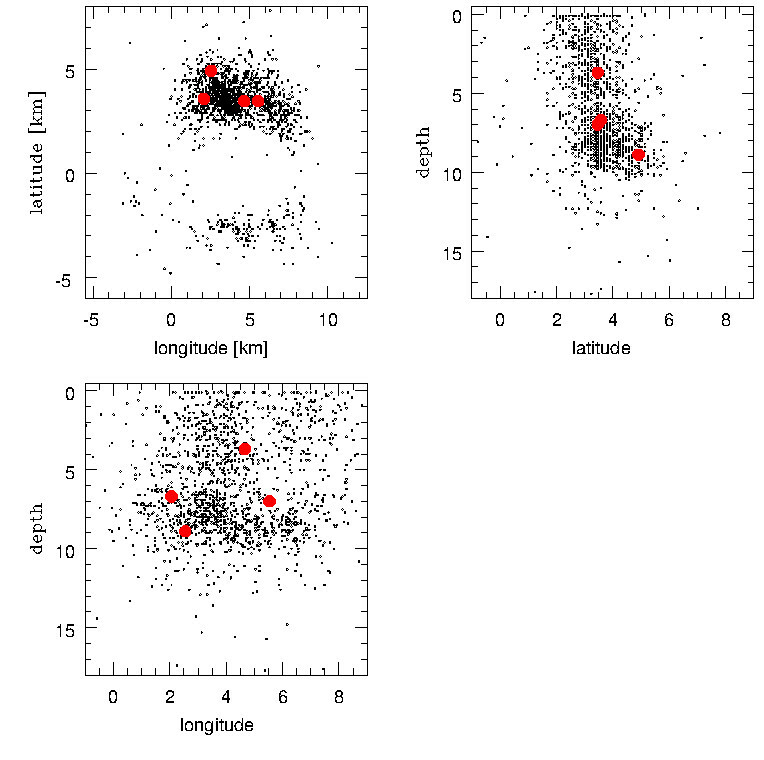 No actual kimberlite eruption has ever been observed. The known ones are almost all ancient, over 30 million years old, and badly eroded. A survivor of the erosion is the Cretaceous Fort a la Corne kimberlites in Canada: pyroclastic cones and volcaniclasts, located on an ancient coast. The Tokapal kimberlite, India, forms a 2-km wide tuff ring around a crater. Angola has a kimberlite volcano which left a layer with a thickness of 130 m, possibly be a solidified lava lake. Overall, these are distinctly unimpressive volcanoes. 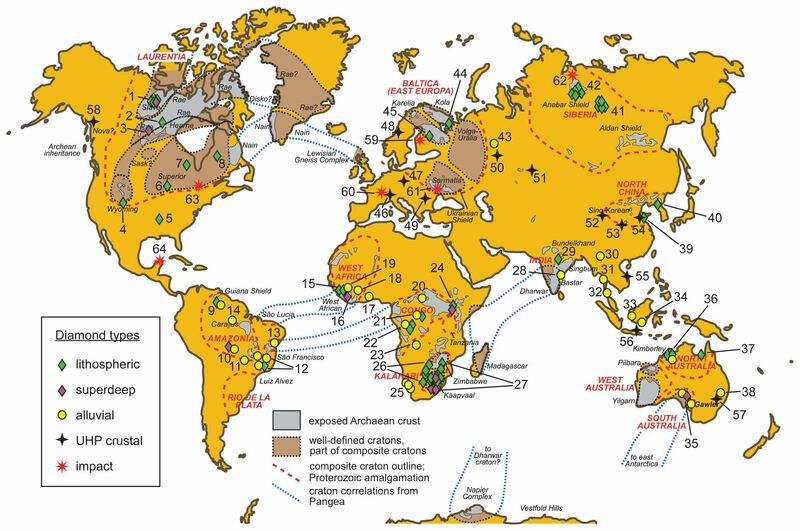 Although there are over 6000 kimberlite locations known, less than a thousand contain diamonds and only about 30 locations are actively mined. A related magma type, lamproite, is more widespread than kimberlite. It also formed from mantle melt below 150 kilometer depth, and is enriched in iron, titanium and potassium but depleted in sodium. Lamproite may on rare occasions contain diamonds. The Argyle and Ellendale diamond mines in Australia (unusually, located off-craton) are mining lamproite, containing diamonds which formed 1.5 billion years ago. Finally, there is one location, in Canada, where diamonds are found in lamprophyre, a potassium- and sodium-rich mineral, which like lamproite is from a large depth in the mantle but formed with a lower melt fraction. These diamonds happen to be the oldest ones known, at 3.5 billion years. It is possible that these diamonds formed at a time when the mantle which was hotter and still little affected by subduction of water. Nowadays, almost all of the upper mantle has been affected by subduction of oceanic plates. The youngest kimberlite volcanoes, by a large margin, are found in the Igwisi Hills in Tanzania, 150 kilometer south of Lake Victoria and a similar distance east of Lake Tanganyika. 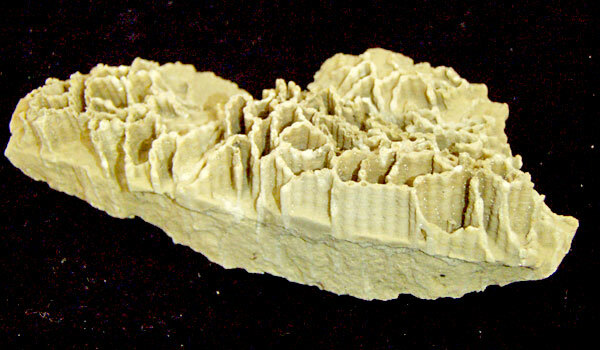 The eruptions are dated to about 12,000 years ago. There are three small volcanoes less than a kilometer apart, with a combined lava volume of 0.0035 km3, and only standing about 20 meters high. The deposits of each of the three volcanoes covers about 300 by 300 meters, and is 50 meter thick. Individual layers of pyroclastic deposits are typically 10 cm thick. The lavas were melted at more than 120 km depth. The hills are within one of the five ancient African cratons; the basement rocks are 2.5 billion years old. The deposits show three eruption phases: First, an explosive outburst of lithic tuffs and lapillistones; Second, juvenile tuffs and lapillistones from weak eruption plumes 1-4 km high, sheared to the north west by trade winds; Third, effusive lava flows of degassed and partially crystalised magma. The first two phases lasted days, perhaps up to a few months, and the effusive phase may have been as short as a few hours. 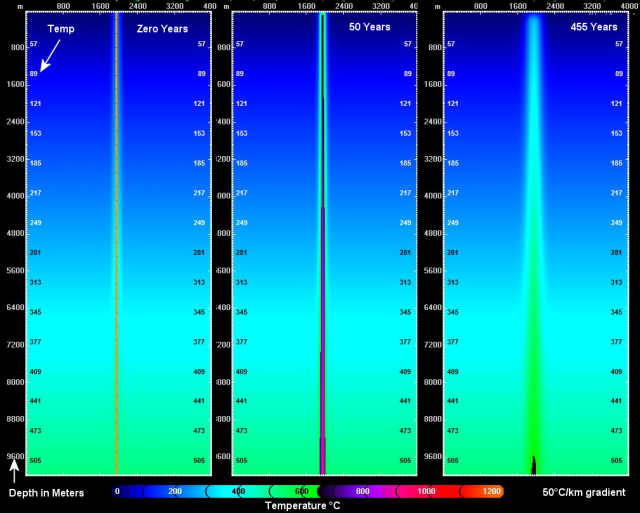 Eruption rates were of order of 1 cubic meter per second. The final cones were higher to the north west due to the prevailing winds. The Igwisi Hills show the typical features of a kimberlite eruption: small, explosive, a very deep origin and ability to break through very thick continental crust. 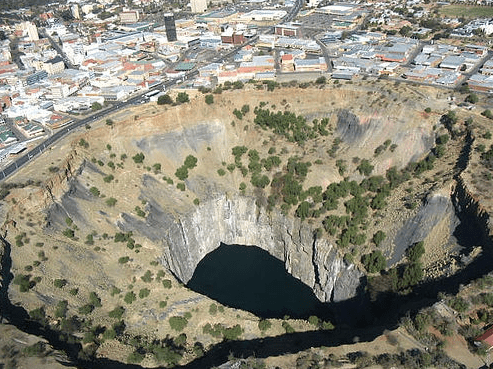 The lack of diamonds is also typical as only 15% of kimberlite volcanoes contain diamonds. The Igwisi volcanoes are fairly close to the African Rift Valley but not on the rift itself. Perhaps this is not a coincidence. The Tanzanian craton has a crustal thickness of 36 kilometer, and is hard enough that the African Ridge bends around it. The thickness in the ridge is less, at 25 kilometer, due to crustal extension. (The ridge is trying to become a spreading ridge but so far hasn’t managed that.) The Igwisi Hills are close to where the Rift Valley would have been had it not decided to go around the craton. The rising mantle plume may be sidetracked, but enough heat still collects below the craton to induce some melt. That diamond you are wearing may be 3 billion years old. It is made of carbon from the oldest oceans, and has seen the first continents on Earth form. After a billion years or more clinging to the bottom of a craton, it traveled through 100 kilometer of rock within hours encased in magma. It is a jewel. ← Does It Have to Be Big? Wonderful article, thank you Albert! For those who wonder about colour in (gem quality) diamonds: “White” diamonds are graded according to the GIA scale from D (Rarest, pure white) to Z (distinctly yellow to the eye). All other colours are referred to by name or as a group “Fancy Coloured Diamonds”. According to the German and Scan. DN nomeclature, the whitest are referred to as “River” (D&E), then follows “Top Wesselton” (F&G), Wesselton (H). Then come the grades for an increasing tint – “Top Crystal (I), Crystal (J) and Top Cape (K&L). The next group have an increasingly discernible yellowish tint – Cape (M&N), “Light Yellow” (O, P, Q & R) and finally “Yellow” (S&Z). Whereas other coloured gemstones usually obtain their colour from metallic oxide impurities such as the chromium red of rubies (Cr2O3 replaces Al2O3) or vanadium green of Tsavorite garnet (VO replaces CaO), diamonds obtain their colour from defects in the crystal lattices. This can be caused by a combination of neutron irradiation (green) and subsequent heating (yellow to brown). 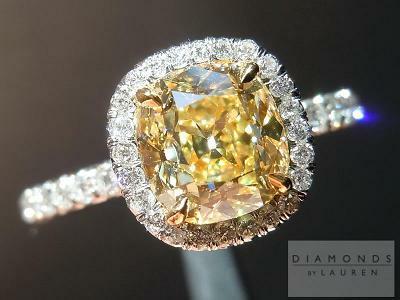 Naturally coloured diamonds seem to derive their colour from minute amounts of impurities in the diamond crystal itself. If one in 100,000 carbon atoms is replaced by nitrogen, the diamond is yellow in colour. If the nitrogen replacement is greater, the colouring get more intense until it is perceived as green. The blue colour is thought to be the result of the replacement of one carbon atom in a million is replaced by boron. As is easily realised, it is extremely difficult to determine the exact cause of each particular colour by atom replacement. Bloody good read Albert! and every rite should be an article for this website. I am sure I read that the Chicxulub event produced a large quantity of diamonds as well and that most of the diamonds ended up in Northern South America. I have a question to ask. Are rubies produced in the same way ? Rubies are a bit of a mystery. They seem to form from continental collisions, rather than subduction. Anyone who knows? 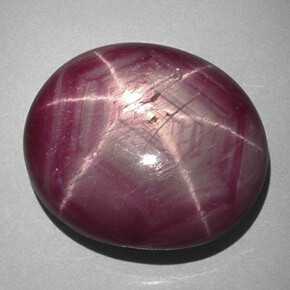 From the mineralogy of the matrix, it would seem that rubies form from metamorphic rocks, i.e. the sediments from erosion that have been reheated until mineralisation can begin again. To expound a bit – Ruby and Sapphire are variants of the mineral Corundum or Al2O3 where in the case of the ruby a small amount of Cr2O3 replaces some of the Al2O3 whereas in the case of sapphire the replacing molecule is a Fe2O3+Ti2O3 biparticle. The greater the iron content/replacement, the duller, darker and more greyish the colour (ruby; violet-purple grey). Asterism is caused by light reflection off very fine rutile (TiO) needles that align in the equilateral triangles ordained by the crystal habit of corundum. Being a rockhounder in the Swiss Alps I really enjoyed reading this article – thank you very much! Any suggestions why the diamonds from the mines in Botswana(Karowe AK6), Lesotho (Lesotho Hope, Lesotho Promise,…) and South Africa (Cullinan, Excelsior,..) are particularly big? Especially Lesotho and Botswana are known to host mines that regularly find big ones.. A very fast carriage or probably they had more time to grow, just to drop some ideas. What is meant by “big” in this context? If I remember correctly, rough diamonds that yield a cut diamond of 1.00 carat (if brilliant cut, 6.5 mm in diameter) or greater are outnumbered ~10,000 to 1 and rough diamonds that yield cut stones of 10 ct or thereabouts are so rare that only a few are found per year worldwide. If as might be inferred from your giving the names of the most celebrated recent finds, it’s about the truly unique finds, no other locality can compete with the ancient mines of Golconda as they are the source of all the truly great historical diamonds and even today, only a few fancy coloured diamonds of any appreciable size have ever been found elsewhere such as the pale yellow 128 ct “Tiffany” or “Tiffany Yellow Diamond” from the Kimberley mine. With most crystals, to grow them big you need to leave them undisturbed for a long time under constant conditions. I would guess that it is the same for diamonds. The size to which they grow may be limited by the amount of carbonate available, and of course, the bigger they grow the more likely they are to contain unwanted inclusions and blemishes. The sticking point may be the transport to the surface. Larger diamonds are more difficult for the magma to carry 100 kilometers or more up (to travel that far up we require rockets and call it space flight!). Perhaps only the most highly driven kimberlite can bring up diamonds the size of the Culligan. 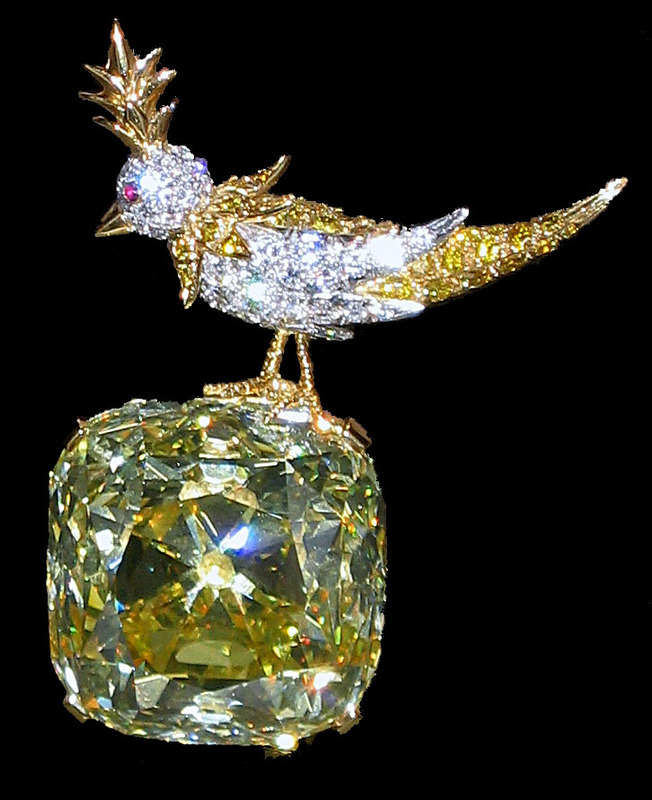 Luckily, pale yellow diamonds (colour grades O – Z) are considered “inferior” to the pure white ones as well as being far more common. Since the clarity grades IF to SI 2 (internally flawless to small inclusions) are virtually indistinguishable to the naked eye, you could probably get a light yellow 2.50 ct, 9 mm diameter R/S SI1 for the same price as a 1 ct, 6.5 mm, TW, VVS brilliant cut diamond and since it has almost twice the surface area, it will appear far larger as it adorns the hand of Mrs Zijlstra. As an added bonus, the inclusions of a natural SI1 clarity-graded diamond are immediately apparent and identifiable to even a layman in a 10x loupe. If you’re really lucky, you could even find an “Old Mine” brilliant cut diamond which is IMO far more pleasing than the modern standard brilliant. This one is 1.33 ct (~6.0 – 6.2 mm), SI1 and colour fancy light yellow (in reality probably U-Z, the colour photoshopped to a higher intensity). That is a fascinating article, Albert, and thank you! I never knew diamond history was so complex! … pulled off a hat trick today. Included in the festivities was a long distance call that was already a day late by the time I was told of it. Been driving all day and dealing with inbred morons on the road. Sore throat, sniffles, and quite chilly for Florida with a nice 25 knt wind that slices right through you. Got a craving for “squashie” sandwich. (our colloquialism for the grill toasted sandwiches available on the cold drunken trek back to the ship in Toulon.) So, I picked up the needed stuff to make one when I got home. Lady at the checkout noticed that I had assorted doggie treats with my stuff. “Oh! You have a dog?” (me) → No, It’s more of a creature that lurks around my house. Wonderful article. Increased my knowledge about how Diamonds are formed. Had no idea Kimberlite was that common, actually. Here is a Wiki on the Arkansas State park that is a Diamond mine. Somewhere, on one of my wayward drives, is my calder spreadsheet. It’s an incomplete set that I was gathering data on a while back. In that spreadsheet, is a reference to a specific type of caldera that is not your typical collapse structure, this one resembles a kimberlite pipe in it’s general shape. The name type caldera is somewhere in Hokaido Japan, but I can’t remember the name of it right now. The shape is like that of an over sized maar. It might be closely related in dynamics to a kimberlite style eruption. Once I mount the other drive I can continue looking for it. And to show you just how mundane the geology is here, the closest thing we have to a native rock, other than an occasional limestone, is limonite. A particularly ugly collection of iron oxides, hardly discernable from a rusted part from an old car. Isn’t that just the normal noises from the very active hydrothermal system in that area? What is notable, if there is a connection between Bard & Grims, there was some very deep activity a few days ago south of Bard right where the dike took a turn. That is an interesting comment from Lewis. He was not the only one of the Inklings to be influenced by the Icelandic sagas. Tolkien is another one. And now Geolurking as well. In the UK, the Beowulf has a Scandinavian background. And Hamlet, of course. …wait a second. I just got lumped in with the likes of Tolkien and Lewis? I may run a bit long in making comments, but I’m no story teller of that calibre. Tolkien and Lewis were members of an Oxford reading group, founded by Tolkien, dedicated to reading Icelandic literature and they named themselves “kolbítur” (Icelandic =coal biters; derived from sitting close to the fire whilst telling yarns – which could, I suppose be called “Geolurking”.). It was out of this that the Inklings were formed. When faced with a fetid supernatural creature sitting on my cask of brandy, the last thing I would think of would be to poke it in the arse with a stick. I’ve wondered if Iceland’s “discovery” was simply the result of a bunch of young men out joyriding around the North Atlantic in Dad’s boat…. Can’t rule it out. Wanderlust is a strong trait. I think it’s a combo of that and Clovis. (Solutrean decendants). Of course the vested interests will try to defecate all over that concept whenever they can. I have been thinking the deep diamonds may be brought up by an accumulation of liberated water from the ringwoodite dehydration reaction. if this reaches a critical concentration it might be able to rapidly ascend from extreme depths. There is some evidence for this in inclusions. If so those earthquakes near the border of Peru and Brazil become *very* interesting. Especially considering theres an importante Diamond field nearby in the Brazilian state of Rondônia. The problem with water driving the ascend is that it only becomes a gas at low pressure. It may be important near the surface but is less likely to be a gas at large depth. CO2 seems to work better, but it does require a change of the chemistry during the ascend. Water may play a role forming the diamonds. Canadian diamonds have been found to have salt water in them (obviously this was tested in impure -and low value- diamonds, and one recent paper suggests that diamond can grow in water in the mantle keel. The proposed chemistry seems to make inclusions of different minerals rather likely though. Note though that the diamonds are far older than the kimberlite eruption. The conditions where diamonds are formed and where they are brought to the surface are very different. Wilson finds that kimberlite eruptions happen with effectively no warning – no preceding earthquakes. The earthquakes under Brazil are mote likely to be associated with diamond formation than diamond deposition on the surface. There was an eruption in new Zealand not so long ago that went from nothing to full on dike intrusion to eruption in a really short period of time. That could be a mechanical/geophysical proxy for what a Kimberlite event would look like, if you throw in a lot of water flashing to steam as it crossed below the critical point as the magma acended. There are plenty of minerals such as garnet (pyrope, almandine), diopside or rutile that can occur as inclusions inside diamonds, meaning that there was continued diamond crystallisation after the included mineral formed/attached itself to a previously grown diamond. 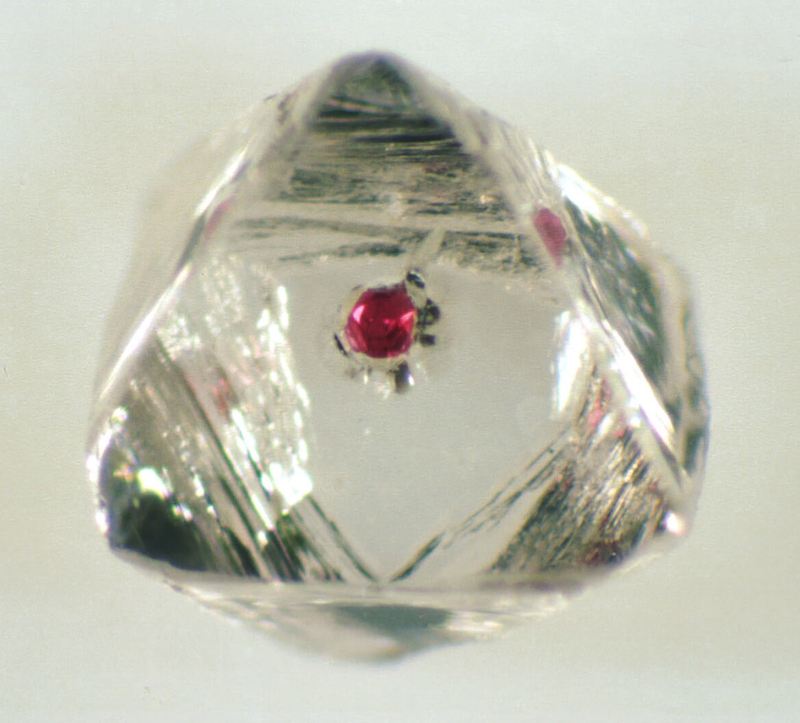 Sometimes these inclusions can be stunningly pretty as with this euhedral pyrope garnet at the centre of a diamond octahedron. In this case, the garnet (“probably”) acted as a seed upon which the diamond grew. And Bardi gives us a green star again! Funny thing about these new quakes. I plotted the location of the larger ones (M2+) compared to the quakes during the 2014/15 eruption (small black dots are the old ones). The new ones are in the same general location, but if you look in detail they don’t quite coincide. They are in places just outside, skirting the edges of the old swarm. I’ll leave the explanation up to others. I think this article is similar to the one posted by Edward earlier today (different URL however). Del Maule is an interesting volcanic system – the High Andes has had a lot of enormous eruptions and calderas, many of which we don’t know much about. I suspect a few reasons as to why this area produces huge eruptions, one of them being the thickness of the overlying crust, which allows magmatic systems to grow to large sizes before they reach a breaking point (this in turn results in larger caldera-forming eruptions than you would see with a shallow magma chamber). This is just speculation on my behalf however. One nice thing about the high andes is that even if we were to see a massive eruption, even on the scale of VEI-7, it’s not likely that this would cause any major loss of life since the area is so remote. That’s not to say it wouldn’t be an issue, but it wouldn’t be a massive disaster on the scale of other VEI-7 eruptions. I will say, Del Maule is likely a very violent volcanic system. We’re lucky it is not near any major metropolitan areas. I suspect Del Maule is likely quite similar to some of its neighboring volcanic systems, which is to say… it’s likely quite monstrous. Just to the north of Del Maule is the 26 x 14 km Calabozos Caldera system, which has produced multiple ashflow sheets up to 500 km^3 in size over the last half million years along with many smaller (but still enormous) eruptions. IF you keep going a bit further north, you arrive at Caldera Atuel, a massive 30×45 km caldera, which is largely un-studied, but we can assume it is a legitimate supervolcano given its size, and the 15 domes / stratovolcanoes that lie inside of it. Just south of it you get a 15 kilometer caldera system known as Domuyo. Singer seemed to suggest in one of the videos I saw (I think from the wikipedia page) that the human effect of a vei6 at laguna del maule would pretty much take out the agriculture for the pampas of argentina and the ten or so hydroelectric power stations on the maule river – and agriculture all through the river systems in chile (if I remember what he said correctly). Though he did say he was more expert at the geology than the human impact of effects. Wow – that’s a serious novel of a read. WOW. That is one monster of a paper. 121 days field work over ten seasons between 1984 and 2000, mostly on foot. And at altitude. Interesting article on how scientists are using ancient plants found in the Atacama desert to understand coastal water temperatures over the last 3000 years. And a diversion for TGMcCoy, enjoy. For those that don’t get it. Hoedown music is native to the Appalachia mountains and formed from Scottish immigrants playing in a style they were accustomed to. Billy Connolly, being a native Scot, is sort of a natural to the music. Limonite can be interesting if you can find samples that formed from altered pyrite. That way they maintain the cubic or octahedral form of the original pyrite. Bárðarbunga now shows clear signs that magma flowing into the volcano. Ármann Höskuldsson volcanologist satisfied that the mountain is preparing volcanic he predicts will be next year or the year after. The eruption of the volcano is defined offspring caldera and now, nine months after the end of the eruption, are signs that this second highest mountain in Iceland is preparing for another conflict. So were detected last day two earthquakes over three levels of the mountain. Ármann says earthquakes have taken to increase by mid-summer. Tension is building up, which presumably means that magma is accumulating again under the volcano. He recalls that Bárðarbunga a volcano on the plate boundary. “When they go off, they uppundir ten years to complete itself,” says arms. But how far could be the next eruption? The eruption of the volcano occurred 40 kilometers from the volcano. Ármann said it was difficult to predict where eldstrókarnir arise next. It could well become another soda flowing or south of the glacier. The deflation around Bard was far field but the same movements would take place if there was a contribution of Grims to the eruption, so which is causing the results on the GPS? Volcanologist Àrmann Höskuldsson is predicting that Bàrðarbunga will erupt again in 2016 or 2017, possibly to the southwest as a new fissure eruption or as an explosive eruption in the caldera itself. the SW really freaked out the Icelandic authotities last time around. I met Àrmann and his people in the field when I was filming at Holuhraun last year. I formed a *lot* of respect for the man and his team. So I’d take this quite seriously. I guess my theories are gaining credence? Putting a time line on an eruption is unwise, as this is probably quite a stable process and the tipping point to instability is probably very unpredictable,anything from weeks to years or maybe not in a lifetime. Probably the best thing that I’ve heard in quite some time. Very sound advice. And as an immediate reply, just to underline the possibility of a fissure eruption SW of BB, a small quake appeared in what I believe is the Veidivötn fissure row. But now I’m a bit confused. I can’t find it on any of the nearby drums. Sure, it is small, but even the smallest quakes are usually visible on the drums. IMO has it at 99% quality, so it seems to be manually confirmed at least. Any thoughts? It’s much too small and insignificant at M 0.8, barely the equivalent energy content of a Happy Meal burger. If another eruption were to occur at Bardarbunga, I would personally be quite surprised if it didn’t just occur at Holuhraun again. The Holuhraun pathway likely represents the easiest pathway for magma to get out at this point. Also, shield volcanoes and lava flows often tend to erupt in separate phases over a period of a few years. I believe the last time an eruption happened in the Holuhraun area, it followed a similar pattern with a series of lava flows over the course of 1-2 decades (followed by a bigger eruption at Askja). Take a wild guess.. Any diamonds on the moon? That is a really good question. You need to go down much deeper in the lunar mantle to get high enough pressures, say 900km or more, where temperatures are probably around 1300 K. Below 1200km depth the silicate is partly melted. That gives a layer of perhaps 300km, between 900 and 1200nm depth, where diamonds could form. However, it is not clear whether there is enough carbon there! Neither is there a clear way to get the diamonds to the surface as there is a lack of volatiles inside the moon. But the huge impacts that have scarred the surface (the late heavy bombardment) could itself have formed diamonds, especially if some of the impactors brought their own carbon. Perhaps you don’t need to dig down very far to find micro-diamonds. I might put them on ebay! Packing and postage might be a problem – buyer collects. Especially since Chondrites (stony meteorites) such as the Tunguska and Chelyabinsk meteorites would reach the surface intact. Impacts as big as the Oceanus Procellarum, Mare Imbrium, Mare Serenitatis etc. would be almost certain to cause diamond formation considering the the Ries (Nördlingen, Germany) did on Earth. If they survived the extreme temperatures afterwards is a different matter. Here’s a little PDF on the spectroscopy of the Ries Diamonds. Want to share this video about Krakatau : http://www.dailymotion.com/video/x34aauv listen to the nice sounds it produces,. At 2.20 it brings you right back to 1883. Thanks – not seen that one before! Now they are saying scientists expect Bàrðarbunga to erupt multiple times over the next DECADE..
What’s even worse is that they are referring to the multiple eruptions in the Bàrðarbunga system 150 years ago and warning that the end scene of that particular scenario was the massive VEI 5 explosive event of Askja in 1875. One thing I have learned (and being anthropomorphic about it) is that volcanoes HATE schedules. For example, the link earlier of Anak Krakatoa shows a pretty impressive bit of activity, but if you look at the system as a whole, it’s right about where it should be, with increased activity between the years 1975 to 2135 at the 95% confidence interval. In other words, not a good place to build a residence right now. As for Bàrðarbunga, yes, that’s a good possibility, but that does not mean that it will happen. Just that it’s quite possible. The only real thing you can infer from a volcanoes behavior, is that it tends to erupt/act like it has previously done. With Krakatoa, the apparent periodicity is probably a function of magma generation rate from the subducting slab, and the ability of the magma to work its way up through the crust to fill the chamber… which was destroyed in 1883 and had to be rebuilt. Then you have to consider whether the caldera roof has gained enough strength for the chamber to build up enough pressure to become capable of catastrophic activity. The same line of logic can be used for the old fissure swarms of the “dead zone.” at 18 mm/year of built up tension stress, has enough stress accumulated for the swarm to rupture? If so, is there enough gas rich and volatile magma there to become something significant? Holuhraun had the stress to rupture, and there was a ready supply of magma in Bàrðarbunga to exploit that pending fracture, but it did not erupt on the scale of Skaftáreldar (Laki) or Veidivotn. It made a pretty decent attempt, but all it managed to do was to keep us guessing whether “Carlvotn” would form or not. Yes, “The Dead Zone” bears watching, but don’t hold your breath. It might take a while. The main thing that really tweaks my interest, is that I call it “The Dead Zone” specifically due to the lack of quakes relative to other areas along the rift line. (and I’m not the first to notice that) Personally, I think there is a reason for the lack of quakes… higher ductility in the underlying rock. That sort of points to it possibly having a high enough temperature that the rocks are not as prone to brittle failure. Evan after 400+ years, it can still be pretty hot down there following a fissure eruption. Made by GeoLurking using KWare’s Heat3D. Another answer to Goldilock’s dilemma, this is very hot yet very cool. One thing that came up in discussion during the early days of VolcanoCafe, was the idea that a central volcano such as Bàrðarbunga or Grimsvotn, could theoretically feed into an opening fissure and unzip the fissure as it did. The Holuhraun eruption sort of proved that idea as the dike was tracked by IMO all the way into the Grimsvotn fissure region where it took a hard left turn and headed off towards the north before broaching the surface where it did. Almost as if the pressure in the region of Grimsvotn was too high to allow it to turn south. The alternative idea (and one that I believed in at the time) was that the fissure opening would allow decompression melt to rocket up to the surface, degassing along the way. The mechanics of my idea never came to pass, but I’m not totally giving up on it. I think that may be how Hekla initially formed. After all, Hekla is not a traditional stratovolcano, it more resembles an over grown fissure-cone row… a REALLY HUGE fissure-cone row. That would also explain why Hekla is so dangerous. In Hekla 2000, the quakes leading to the eruption didn’t start until about 60 minutes prior to the eruption being “full-on”, and did not cross the threshold of human perception (standing there on the summit and feeling it shake) until about 15 minutes before it went. With Hekla sitting right on the end of the SISZ next to a collection of Riedel shear structures known as “sprungur” on the SISZ map, I think Hekla could see an opportunity to open up as well if the “Dead Zone” experiences much more expansion. The question is from where Hekla feeds – immediately below only, from the west with the SISZ graben blocking magmatic egress from the MAR or (highly unlikely as Torfajökull is in the way) from the east where it would be MAR + hotspot or even a combination of two and more. Following the eq activity of the past two decades and especially the last decade, it would seem that the western part of the MAR from the Reykjanes Ridge through Reykjanes to the SISZ might be opening up/unzipping. Hekla is believed to be fed directly from below. The magma chamber (inflating) is 24 km deep and is located 10km below the depth where the transform fault (the South Iceland Seismic Zone) locks. Thus it has its own source from the lower cust or even the Moho. Torfajokull is perhaps more complex as it is located on the intersection of the transform fault and the east Iceland spreading ridge. It is (or was a few years ago) deflating. It seems to have a separate magma source from Hekla. I’m obscure as always. What I mean is the really deep source, below crust and astenosphere, what drives the MAR which passes through all of Iceland. When it unzips, it allows energy (carried by magma) to expand upwards but in a place such as the SISZ where it seems a graben blocks magma from erupting, where does the energy go to? Has to move sideways, hasn’t it? The SISZ is a transform fault. The energy goes into shear rather than pull – unzipping may not be the right word. At the same time there is a northeast trending line with Hekla at its head, so perhaps this is one of the places where the MAR tried to redevelop when it moved east 3 million years ago. Iceland is complex. One paper mentioned that in the SISZ you tend to get sequences of quakes moving east to west. That would imply the tension gives way first near Hekla. Forgive an ultra-amateur’s intervention, but I don’t understand why the tension would “give way first near Hekla”. Wouldn’t the tension in the SISZ be dispersed along the faults around Hengill/Hveragerdi/Thorlakshofn, before it reached Hekla, just as we are seeing at the moment? That’s the issue. All that is noted is that it seems that the cluster/swarms tend to track in that way. Why is does it is the reason we are here. To kick it around and maybe hazard a reason as to why it happens that way. I’ve seen similar tracking swarm/quake activity when plotting 30 years worth of quakes along a 50 km zone around the San Andreas/Imperial fault boundary. Most track north, but some track south. My interpretation is that the area acts like the rough edges of broken pottery that you are trying to piece back together. You can feel the rough boundary edges grinding against each other until they finally glide into place. I think it make a good analogy, though much much smaller in scale to the real world of plate boundaries moving against each other. With the pottery, each time you feel it grind, would be the micro scale equivalent to a quake. Would be it too radical to assume there is a substantial, longstanding shallow magma emplacement (not a chamber as such),at Bardabunga .This magma being of a different compostition (rhyolite? ),to what was erupted last year.This emplacement being rather stable ,due to the glacier.The risk being the potential influence of an enormous amount of deep sourced basalt magma ,due to its location in Iceland.In essence a balancing act between ice and fire that has been going on for thousands of years? The glacier and in temperate climates a lake,maybe acts as a moderator to the tremendous forces going on at depth and helps prevent things getting out of control.Kind of like the cooling system of a nuclear reactor preventing things going super critical.So the central part of these systems remain relatively stable for thousands of years, unless the heat source overwhelms the moderator.Anyway just a thought. Why? This way everyone is aware that there are two URLs pointing to the same article. GL Edit: I refuse to delete it on the grounds that one of the links could become stale in the future and an alternate URL could solve the problem. Perhaps someone knows: I am looking for what time of the year the Hekla eruption in 1104 occured. All-knowing wikipedia has it as ‘probably autumn’ and another site lists 15 Oct (which is probably a guess asit is exactly mid autumn). Could it have been in spring? Merry christmas! New post is up.